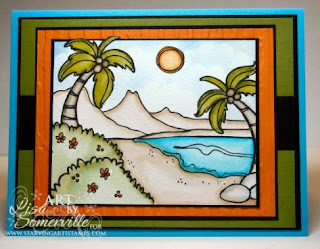 Okay, so I'm really not off to the tropics, but my card makes me want to be there! I used the CuttleBug Challenge 39 as the inspiration for my colors. I stamped the DoodleFactory Tropics Backdrop in Black on watercolor paper, and colored using the Marker Watercoloring Technique from a past issue of The Technique Junkies Newsletter. When cutting the image I left the top Palm Trees cut out for the Out of the Box look. To create the look of clouds, I sponged ink using over a scrap punched with the Scallop Punch. The Orange panel was embossed with the CuttleBug Distressed Stripes folder. Off to find a nice chair to sit and enjoy the weather! This card is awesome!!! tfs!! wow! You are amazing - that card is great! Hi Lisa..Your card is `gorgeous` Hmmm would be nice though to go to the tropics right now!!! !